Contrary to the endless lies of government climate scientists, there has been little or no troposphere warming since 1990. There was also no troposphere warming from the 1950s to 1990 or 2000. When did this imaginary global warming occur? Al Gore has a problem. He seems to want people to believe that only climate skeptics oppose renewables. The truth is, a small but growing number of prominent greens, openly acknowledge that renewables in their current form are not a scalable replacement for fossil fuels. Water always finds its level. SunEdison, which bills itself as the world’s largest green energy company, may soon file for bankruptcy protection, according to a recent Securities and Exchange Commission filing, as the company faces “liquidity difficulties” despite getting millions in government subsidies. An SEC filing from TerraForm Global, a unit of SunEdison, claims “due to SunEdison’s liquidity difficulties, there is a substantial risk that SunEdison will soon seek bankruptcy protection.” Both SunEdison and TerraForm are delaying the filing of their annual financial report to the SEC. NSIDC has provisionally announced that Arctic sea ice extent has recorded the lowest maximum in the satellite record. The reality is much more boring. According to NSIDC themselves, maximum extent this year has dropped from 5.612 to 5.607 million sq miles since last year. Such a small amount must be well within the margin of error, although these are not published. Far from collapsing, Arctic sea ice area has been remarkably stable in the last decade. And with multi year ice continuing to recover from 2008 lows, ice volume has also been growing in the last few years. ‘Green’ Germany, only in name. The Germans went into wind power harder and faster than anyone else – and the cost of doing so is catching up with a vengeance. The subsidies have been colossal and the impacts on the electricity market chaotic. Some 800,000 German homes have been disconnected from the grid – victims of what is euphemistically called “fuel poverty”. Power starved Germans, instead of freezing, grabbed their axes and tramped into their forests to improve their sense of energy security – although foresters apparently take the view that this self-help measure is nothing more than blatant timber theft (see our post here). WITHOUT access to fossil fuels, every tree on the planet would have been cut down by now to provide for peoples heating, cooking and industry. THE greatest threat to the environment is not affluence, it’s poverty. BORDER between Haiti and the Dominican Republic: Guess which country contains eco-criminals that can afford to use fossil fuels, and which country contains nature-lovers who are dependent on natural renewable organic biomass for energy? HAITI is almost 99% deforested, as they rely almost entirely on natural ‘biomass’ (wood) for domestic and industrial fuels. 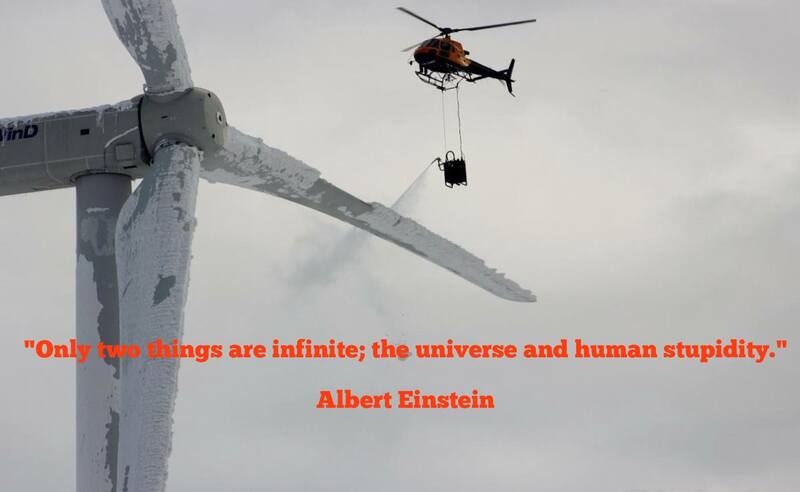 EMBRACE the UN’s draconian climate regulations and pursue the mad push into unreliables – wind and solar – and become join Haiti in the race to energy poverty and complete environmental devastation. TREE-theft to keep warm in Germany began back in 2013 when Energiewende was in its infancy. THE Energiewende (German for energy transition) was legislated into German law in 2010 and is “the planned transition by Germany to a low carbon, environmentally sound, reliable, and affordable energy supply” (wiki). AFTER nearly a €TRILLION Euros of taxpayer’s hard-earned money spent on sunshine and breezes, Germany’s Energiewende program has been exposed as a catastrophic failure, with carbon dioxide emissions higher now than in 2009, the year before the mad rush into subsidised ‘green’ energy began! WHEN will the ideological push for symbolic, costly, unreliable, unwanted, economically and environmentally destructive ‘green energy’ end? ALL pain, for ZERO gain! We’ve mentioned many times the lack of major landfalling hurricanes on the USA being in a record drought. When the Atlantic hurricane season starts on June 1st, 13 days from now, it will have been (barring a miracle storm) 2,777 days since the last time an intense (that is a Category 3, 4 or 5) hurricane made landfall along the US coast (Wilma in 2005). 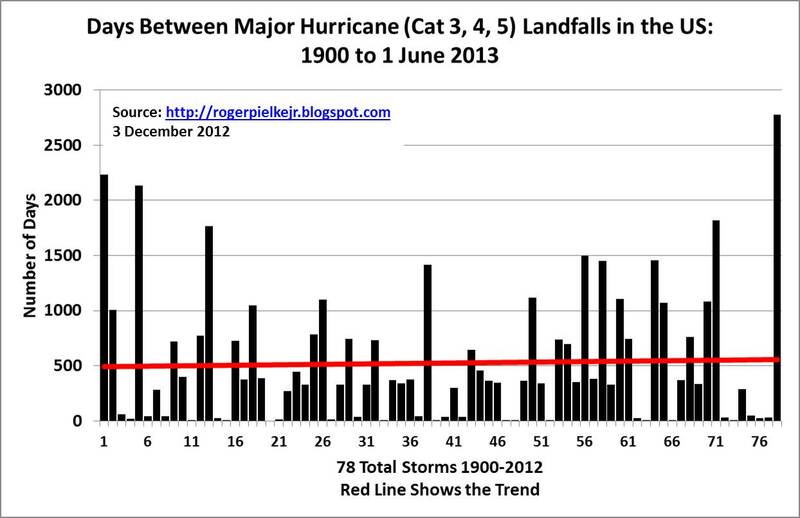 Such a prolonged period without an intense hurricane landfall has not been observed since 1900. Source: Dr. Roger Pielke Jr.
We’ve also routinely talked about Accumulated Cyclone Energy (ACE) being down. You can see the downtrends on the WUWT Extreme Weather Page.